After catching several of my colleagues in the act of practicing healthy wellness activities over the past week, I thought it only appropriate to highlight my workplace, the International Foundation of Employee Benefit Plans, as an organization that not only provides education on workplace wellness trends but takes it to the next level with our Healthy Workplace staff initiative. 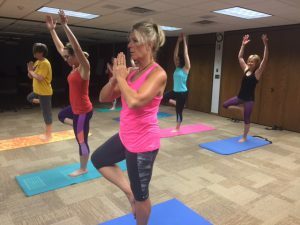 Step into the headquarters of the International Foundation, in humble Brookfield, Wisconsin, where workplace wellness data trends fall off the pages of our latest research reports and into the attitudes of our 140 staff members. The importance of mental health benefits is becoming more prominent in workplaces. 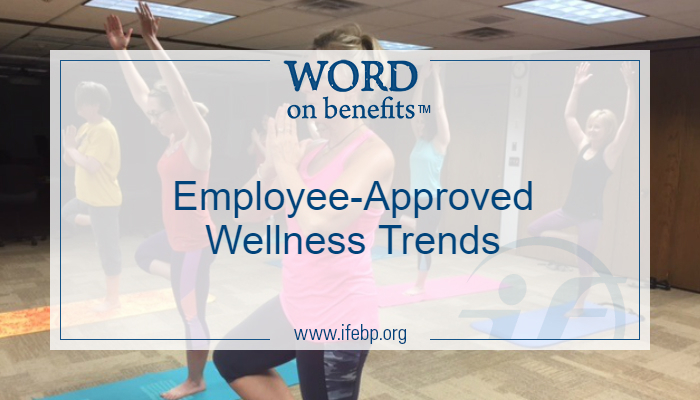 In Workplace Wellness Trends: 2017 Survey Results, we learned that U.S. and Canadian employers most commonly offer employee assistance programs (85%), mental health coverage (63%) and substance abuse benefits/coverage (54%). Mental health support in the workplace is a growing need, as Mental Health and Substance Abuse Benefits: 2016 Survey Results revealed that 62% of U.S. and Canadian organizations reported depression as prevalent in their workplaces. To address mental health concerns, 93% of organizations offer some sort of mental health/substance abuse benefits. Tip—Encourage employees to take daily 10-minute mindfulness breaks, and provide designated, distraction-free spaces. 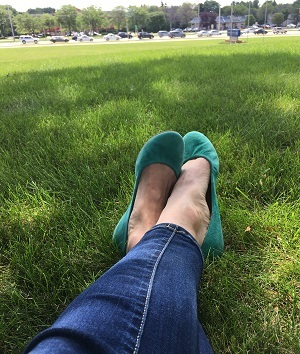 My teammate, Ann, captured a photo of herself over lunch using a mindfulness app on her phone. Mindfulness is a form of meditation that gives your brain a break and helps you develop a healthier state of mind. Practicing yoga in one of our conference rooms. 32% of employers offer on-site exercise classes. Social wellness is quickly emerging as a key wellness initiative for successful organizations. 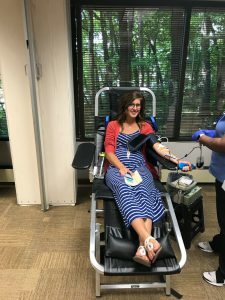 According to Workplace Wellness Trends, the most common social and community health initiatives offered by workplaces are community charity drives (59%); on-site events and celebrations like wedding and baby showers, department parties and birthday fun (58%); community volunteer projects (53%), staff outings (47%); and blood drives (47%). We participate in our share of volunteer projects, on-site celebrations, staff outings and regular blood drives at the International Foundation. But giving employees a sense of community can be as easy as encouraging co-workers to eat lunch together, even if it’s just once a week. Tip—Get it on their calendars! Select leaders for lunch groups, and have them send out regular invitations. 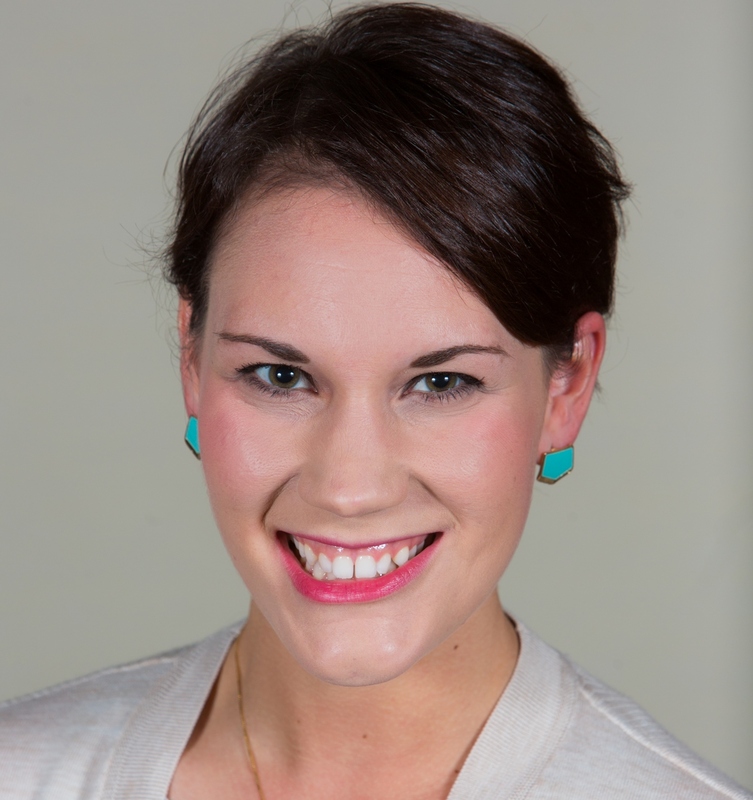 Graphic Designer Laura helped save lives at our blood drive this week. Ah . . . the classic workplace wellness combo—eating right and exercising. Although more nontraditional wellness initiatives are emerging, the popularity of fitness and nutrition benefits has held steady, changing with the times and giving way to standing/walking workstations (45% of organizations offer), wearable fitness trackers (25% offer) and on-site exercise classes (35% offer). 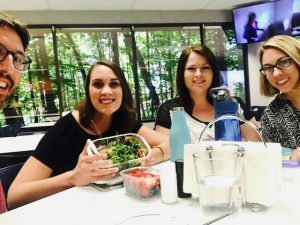 My lovely co-workers are pictured below participating in a few of our fitness and nutrition offerings, including bocce tournaments and working at our treadmill walking desk. Tip—Make it easy for employees to schedule sessions at shared walking or standing workstations. 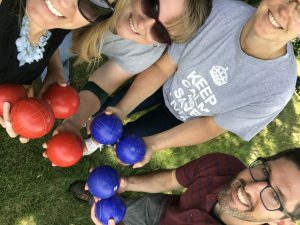 Our summer bocce ball league is a great way to stay active and bring staff members together from all different departments! 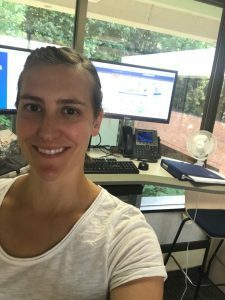 Information Specialist Jenny snapped a selfie at the walking treadmill station! Staff members love walk-working! I’m proud to work for an organization where we practice what we preach. Every organization is different but developing a culture of workplace wellness isn’t a cake (er, kale?) walk. Our most recent research found that successful wellness programs take a lot of time (the average organization had had a program in place for seven years), a budget (more than 63% have budgets devoted to wellness) and support from the top. If you want to dig into that report yourself, you can find it here.